After the last issue it’s fair to expect a dip back to normality as the series pivots its story plot, and Wolverines #7 is that plunge. If you just picked up Wolverines mid-series, do yourself a favor and enjoy Wolverines #6 – it’s a fast-paced highlight reel of everything this series has to offer so far. It’s worth it just to see Sinister strike fear in everyone’s heart, only for Storm to appear and threaten to murder him. Sinister changes his tune, like “With all due respect, could we maybe talk about this later?” And when Storm says “No,” in her big-girl voice Sinister’s like “You didn’t have to punk me in front of company,” and you almost feel bad for him the way you did the bully in 6th grade when he turned Charmin in front of 8th graders. This issue does begin with Mystique’s own badassery though as she steps to what’s left of their “team” of Wolverines – Shugun, Deathstrike, Sabretooth, and X-23 – and reminds them whose boss. We were fair to assume Shogun was the boss; he has the control words, after all, which can cause any one of them to fall under his hypnosis. Maybe that was back when the teams were even and there were 5 controllers against 5 controlled, but since the rest of the Paradise squad is now dead, missing, or turned traitor, these new odds seem to change Mystique’s feelings on the subject. She turned and gave them the speech Lebron gave the Heat after they lost the 2011 NBA Finals. And then she gets to work. First things first, Mystique has to shake the control words that hypnotizes her. There are “erase words” that break the spell and can free them from the control words, so the queen of manipulations gets to plotting. Why didn’t she do this sooner? Because then we wouldn’t have had the first story arc and they would’ve never gone to Sinister’s fortress, and issue #6 just needed to happen. Now that that’s happened, Mystique can stop being dumb. She summons Shogun to the principal’s office and he reacts like when you know you did a lot of things wrong this week and you’re not sure which one you’re about to get called on. He practically has a whole conversation between his two personalities convincing each other everything will be okay. What Mystique wants is for the two of them to go on a mission together to steal something she wants. 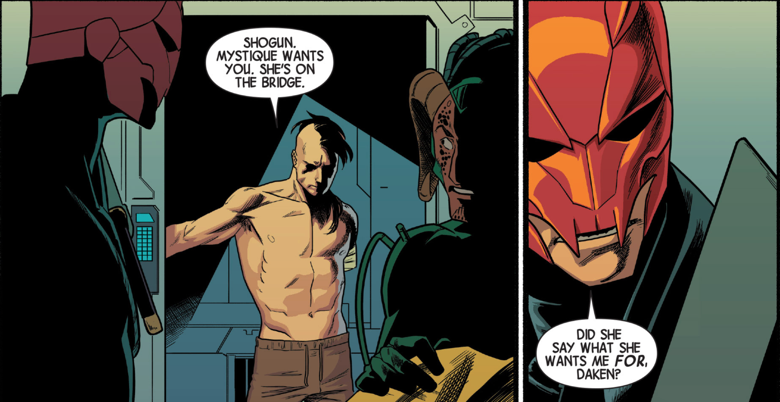 It’s fun reading a conversation between a manipulator like Mystique, and a person with two souls in one body like Shogun. For every one of her lines, Shogun needs a soliloquy on how to navigate the minefield of her words. They end up going out together alone on their heist mission. 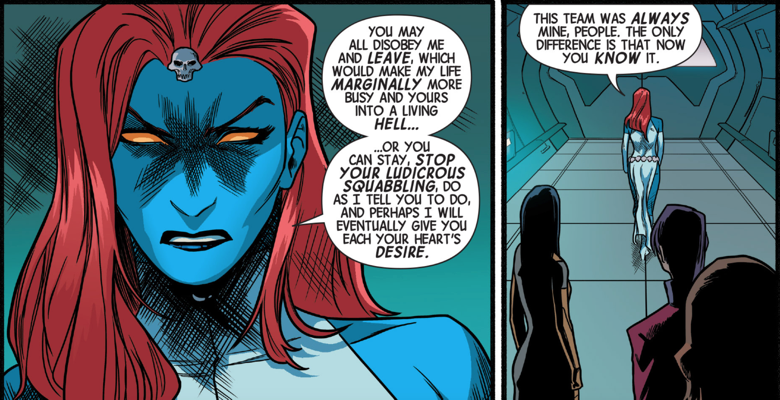 Mystique drops the mic and walks off stage as the baddest woman in the room, and you just hope someone else is stupid enough to step up so she can spit more flames. Wolverines #7 is as good a follow-up as could’ve been reasonably expected and, as an added bonus, most of the Paradise squad is absent from the issue. The more they leave them behind, the better this series can thrive, with the clear exception of Fantomelle and her psychic pet fox Culpepper. As a weekly, it’s fair to consider the strength of this series as a pleasant surprise, and I’m looking forward to issue #8.